In the category for the best presented tasting room or winery, the winner was Domaine Cazes in Rivesaltes in the Roussillon region. For the best restaurant in a vineyard area, the winner was Olivier Leflaife in Puligny Montrachet in Burgundy’s Côte de Beaune. The winner in the category for creating a network of wine tourism resources linked with a regional wine centre was the Route des Vins du Jura (the Jura Wine Route). The creation of the ‘Pique-nique chez les vignerons’ event in Alsace won the prize for the promotion of a wine tourism event or feature. The winners receive a plaque and also – apparently – public relations help with promoting the award. 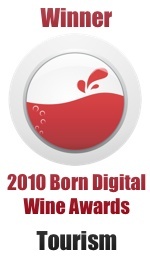 (Needless to say no-one has yet officially contacted Wine Travel Guides about these awards). As these were the first ever awards, the wine tourism council decided to mention four family wine producers they consider to be pioneers in wine tourism. These producers will also help on the council, which was only formed last year. These last four recognitions demonstrate to me quite simply the public relations power of certain wine families in France. I will say no more except that there are other pioneers that could have been selected – let’s hope they will enter next year’s competition and receive just recompense. The only other similar awards that I know of in Europe are the Great Wine Capitals Awards and these of course only cover one city/wine region per country so, in France that’s Bordeaux. I do hope these awards encourage more French wine producers to fully embrace the potential of wine tourism. The next task of France’s wine tourism council is to create a new seal of approval awarded to those who fulfil certain designated standards of wine tourism. Applications are being called for now.